Snap-on dentures, also known as overdentures, are a fantastic development in dental technology which allows for dentures to be secured to the jaw, providing protection and strength to the bone, and allowing the patient the pleasure of having replacement teeth that look and feel as good as natural. 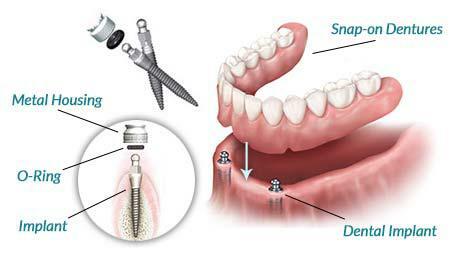 Snap-on dentures negate many of the negative aspects of conventional dentures. Snap-on dentures, on the other hand, are fixed to a set of dental implants, which gives them extra security and stability in your mouth. The prosthodontist fits a set of implants; usually around 2-4 for the upper jaw, and around 4-8 for the more complicated job of fixing dentures to the lower jaw. Not secured to anything, dentures can move around in your mouth, and sometimes even fall out. The dentures can also rub against your cheeks and gums, and cause your mouth to be sore. This is especially likely to happen after several years, after the jaw starts to wear thin. Ordinary dentures don’t provide protection for the jaw. The treatment is tailored to the individual and their needs. Having a few simple dental implants installed is much different to having bone grafting surgery to support them for example. An initial consultation will help prosthodontists to diagnose the condition of your mouth. Preparation work for dental implants can include tooth extraction, and gum and bone grafts. Preparation aside, the dental implant procedure is relatively straightforward. Your prosthodontist will fix a titanium screw like fixture to replace the root of your missing teeth. The number of implants can vary but tends to be 2-4 for the top, and 4-8 for the bottom, in a particular format that will provide the best structure and security. An abutment will be attached, and then when the implants heal, you can have a set of replacement teeth in the form of dentures, which are fixed to the abutment. These will have been custom made for you in a laboratory, usually using data obtained from a CT scan during the initial consultation. Friedman Dental Group offers a range of dental solutions for missing teeth, from dental implants to dentures, and everything in between. Your dental implant dentist will discuss your options for dental surgery with you during your initial consultation, which we offer free of charge. Contact us today to find out more.